No feature of the Army of the Potomac contributed more to its success than the field telegraph. Guided by its young chief, Mr. A. H. Caldwell, its lines bound the corps together like a perfect nervous sytem, and bore unerringly to the great controlling head of the army, the wants and sympathies of its members. Its introduction was cotemporary with the organization of the army in 1861, but not until Grant cut loose from Washington and started from Brandy Station for Richmond was its full power tested. Headquarters was furnished with a peculiarly constructed wagon, containing a galvanic battery of one hundred cups, divided into sections, which might be separated, if necessary, and attached to different stations. Seven fine wires, insulated in gutta percha, and flexible as a hempen cord, formed a line less than one eighth of an inch in diameter, which was wound upon reels and carried by pack mules. Thirty operators and a few orderlies completed the outfit. 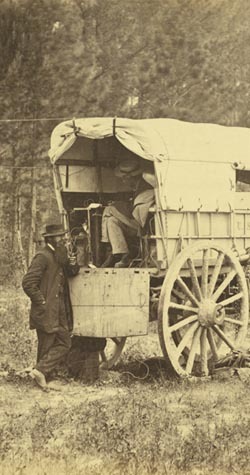 The army crossed the Rapidan with the telegraph line going up at the rate of two lines an hour, and Grant talked with his commanders in the Wilderness on the right and left, by the click of a little magnet. There was no time after that when every corps was not in direct communication with the Commanding General. The Army moved down towards Richmond along the front of the Confederates by constantly shifting corps from the right to the left of the main body, and always keeping an immovable centre. At Spottsylvania the Second Corps, at sundown, swung round from the extreme right in rear of the main body to the left. Ewell saw the movement, and swept down upon the exposed position, but the telegraph signaled the danger, and troops in a double-quick filled up the vacancy before the astounded enemy could assault our lines. Beyond the James river, operators in bomb-proofs under constant fire, reported every demonstration along the works; and if the guns broke out suddenly in the night, the Commanding General in his quarters had only to ask an operator at his side to know the cause. All the way from the broken lines at Petersburg to Appomattox Court-House, the telegraph kept pace with the front in the headlong race, and faithfully throbbed with the pulsations of the Army. Corps were sent out to flank the enemy with only a slender iron thread to hang their hopes of help upon, but their succor, when needed, never failed. Through thickets, swamps, and over rushing streams, the lines stretched on, following Grant as he swooped upon the front of Lee's flying troops, and half an hour after the last gun was fired at Appomattox Court-House, the news of victory flashed along the wires to City Point. Important dispatches were always sent in cipher which none but a few operators could read, and which were always translated before being delivered. Sometimes the enemy tapped the wires, but in consequence of this precaution the information thus obtained never proved of any value to them. The operators were frequently under fire, and calmly sitting at the instrument with shell flying over and around them, performed their duty in a manner that won an enviable reputation for courage. At the Petersburg mine explosion, an operator sat close at hand with an instrument, and notified Gen. Meade of the progress of affairs until the occasion no longer required his presence. The triumph of the field telegraph has exceeded the most sanguine expectations. From the opening of Grant's Campaign in the Wilderness to its close at Lee's surrender, an aggregate of over two hundred miles of wire was put up and taken down, without interfering in the least with its efficiency as a constant means of communication between the several commands. The Army of the Potomac was the first to demonstrate the advantages of the telegraph for conducting military operations, and the future campaigns of all civilized nations must in a great measure depend for success upon this great auxiliary.